¶ 1 Leave a comment on paragraph 1 2 This is a deeply personal essay for me. I am writing it because I want #FYCchat, an educational Twitter chat that I co-founded and nurtured for more than three years, to live on and be recognized in some way as scholarly. The scholarly value of Twitter is currently being debated and theorized by people like Bonnie Stewart, Jesse Stommel, Jessie Daniels, and others. This essay is a case study, a preliminary inquiry, an invitation. It is written from the margins (of Internet and Network theory) about the margins (of Rhet-Comp) for an event that took place in the margins (on Twitter). That it needs to be an essay in a peer-reviewed forum, however innovative, to move from the margins and into a more visible and sanctioned space is problematic; the whole point of #FYCchat was to move into new forms of communicating, sharing, and even forming knowledge. ¶ 2 Leave a comment on paragraph 2 2 #FYCchat was not born from theory, but from necessity. And also affect – the founders of the chat and subsequent participants all felt something about the chat and the community we were trying to form, to find, to make for ourselves. We felt like there was something special going on in other education-related Twitter chats. We certainly saw it empirically, but, speaking for myself, witnessing and participating in these Twitter chats, pre-#FYCchat, stirred something in me, and part of the goal was to recreate that for a community of first-year composition instructors. This essay, then, is necessarily biased, and I found it impossible to discuss and study #FYCchat in any sort of detached, “academic” way. I hope that presenting the essay in this format, in open peer-review, helps it to become the essay it needs to be, or if not, inspires someone else who can write the academic essay #FYCchat deserves. ¶ 3 Leave a comment on paragraph 3 1 I have been teaching composition for almost ten years, the majority of that time in a contingent position. I do not have any formal graduate training in rhetoric and composition; my PhD isn’t even in English (it’s Comparative Literature). And while I had a strong mentor in my first year of teaching first-year composition, the longer I taught Freshman Writing, the less guidance I received and the more I realized how much I didn’t know about best practices, strategies, etc. ¶ 4 Leave a comment on paragraph 4 2 I was the embodiment of an intersection of problems that many are very passionate about but few have been able to meaningfully address: contingency and literature training in the rhet-comp classroom. In an ideal world, Freshman Writing would be taught by tenured and tenure-track faculty who have at least some graduate-level work in rhetoric and composition. In reality, people like me need to eat, and regional public universities (which are horribly underfunded) need people to teach Freshman Writing. ¶ 5 Leave a comment on paragraph 5 1 Mentorship becomes difficult. Collaboration is almost impossible. Power dynamics in terms of position, expertise, and tradition influence all interactions between “colleagues” both within the institution and beyond. Heavy teaching loads made a traditional self-education in rhet-comp scholarship difficult, and with no direction in the form of a supportive mentor, almost impossible as well. ¶ 6 Leave a comment on paragraph 6 2 Steve Lamos does an excellent job summarizing much of the situation of writing instructions within higher education in his article “Credentialing College Writing Teachers: WPAs and Labor Reform”: “the denigration of college writing teachers and their work has clearly continued. Much college writing instruction…continues to be performed by non-tenure track faculty higher ed into ‘casualized’ positions…This instruction also tends to be ‘feminized’ – that is, both performed disproportionately by women…and disregarded as excessively ‘emotional’…” (2011, 46). However, his solution was antithetical to the one I was seeking: not more credentialing through formalized means, but instead learning and forming community through new technologies. ¶ 7 Leave a comment on paragraph 7 0 The issues intersected and overlapped. I was marginalized geographically based on where I was teaching (Eastern Kentucky in the heart of Appalachia), I was marginalized because I was teaching off the tenure track, and I was marginalized because of what I was teaching. I sought community online through my blogging efforts, but I quickly ran up against the politics of a literature PhD in the writing classroom; my posts on teaching writing attracted the most vitriol in the comments. Conversations that sought to focus on the discipline devolved into exercises in disciplining me in the most negative sense; my work and openness to learn were met with hostility. While not representative of the discipline as a whole, these experiences certainly didn’t encourage me. ¶ 8 Leave a comment on paragraph 8 2 It is a coincidence that I discovered Twitter around the same time that Lamos was writing his article, but it is significant. While the establishment was seeking formalized solutions to the problem I found myself stuck in, I was seeking my own informal path relatively on my own. On Twitter, I quickly fell in with the educators through #edchat and #engchat and other education- and teaching-related hashtags and chats. It was a lifeline for me; I had found a community of like-minded educators who challenged me and supported me, and I learned from them. I found a community that I didn’t have access to on the ground on my campus or within the discipline itself. We shared resources with one another, answered questions, and offered advice. ¶ 9 Leave a comment on paragraph 9 1 Why, I wondered, couldn’t we have a community like this around the teaching of Freshman Writing? ¶ 10 Leave a comment on paragraph 10 1 The idea of connected learning is not new. George Siemens has written extensively about the complexity of learning systems, where learning is “the act of forming networks, enabling adaptability of learning agents, and attendant emergence” (2007, 108). This kind of complex learning is particularly well-suited to Twitter, and has been used by educators around the world to expand professional networks and learning opportunities (for an extensive list of education-related Twitter chats, see Cybrary Man’s list on his site). ¶ 11 Leave a comment on paragraph 11 1 Education-related Twitter chats are gaining increased attention by scholars as an alternative to professional development for K-12 teachers and as a way to retain teachers. Work by Carpender and Kruthka (2014) show that educators who are on Twitter frequently share resources and identify it as providing some of the most effective professional development they have ever experienced. Particularly attractive to teachers was the interactivity of the Twitter chats and the ability to personalize and differentiate their learning and development. ¶ 12 Leave a comment on paragraph 12 1 Hartigan and Curran (2013), looking specifically at #kinderchat (a chat targeting kindergarten teachers), found encouraging results in that the chat helped support new teachers, particularly those who did not have a lot of support on the ground at their school. These forms of collaborative learning are important for the development of teachers, as well as mirroring the kinds of activities that can and should be taking place in the classroom and beyond. ¶ 14 Leave a comment on paragraph 14 1 Twitter chats are non-hierarchical and engage in what Claudia Megele (2014) calls “a multilogue conversation” (49). She also identifies the learning that takes place on Twitter as “extensively informal” (49) and notes that participants in the chats “make their knowledge visible in the form of tweets and become active coprosumers and coproducers of knowledge” (49, emphasis added). The collaborative formation of knowledge and the more informal nature of Twitter allows for non-traditional mentorship relationships to develop, ones that are more reciprocal than hierarchical. Pair that with the fact that the majority of Twitter users in higher education are under the age of 45 and thus probably untenured (Seaman and Tinti-Kane, 2013), and you can see how Twitter presents pathways for new and different mentorship and collaborations. ¶ 15 Leave a comment on paragraph 15 0 Twitter also provides an opportunity for those of us in lower-rung faculty roles to develop meaningful and fruitful relationships, as well as closing important knowledge gaps. ¶ 16 Leave a comment on paragraph 16 0 I started #FYCchat in January 2011 with Nicole Papaioannou, who was, at the time, a PhD student in Rhetoric and Composition. In late 2010, I saw her tweet a question asking if there was, in fact, a Twitter chat for teachers of Freshman Writing. I replied that there wasn’t and we should just start one. So we did. We had never met before (and have not yet to this day), but we started a Google doc and brainstormed topics, decided on a hashtag, day, and time, and set about promoting the chat. ¶ 17 Leave a comment on paragraph 17 0 Our first chat was on January 12th, 2011, and the topic was our over-all approach to or design for our Freshman Writing class. We initially archived the chats using tools such as Whatthehashtag and TwapperKeeper, but those archives were lost through the various Twitter API updates. We do have an archive of our chat topics on FYCchat.blogspot.com. ¶ 18 Leave a comment on paragraph 18 0 According to Budak and Agarwal (2013), who included #FYCchat in their larger study of Twitter education chats, we are also quite geographically diverse but largely centered in the United States. Their sample size of 42 individual weekly chat sessions revealed that there had been 467 unique participants and almost six thousand tweets generated (169). The participants have ranged from graduate students, contingent faculty, writing center directors, writing program directors, education professors, as well as people who are in alt-ac positions that involve writing instruction and consultations. We also represented a wide variety of institution types, and those opportunities to share and learn from each other from differing institutional perspectives was also important. ¶ 19 Leave a comment on paragraph 19 0 Over the course of the three-plus years of #FYCchat, we have collaborated twice with #engchat to talk about the transition from high school writing to college (archives in PDF), and presented on the chat at both the National Council of Teachers of English (NCTE) conference and at the Conference on College Communication and Composition (CCCC). We collaboratively wrote our proposals using Google Docs and Twitter (see an archive of the process here). The chat became more than just a weekly opportunity to collaboratively learn and share, but also a community that collaborated on research and best practices. ¶ 20 Leave a comment on paragraph 20 0 We mentored each other through the years, and learned a great deal about teaching not only composition, but also different populations of students; I might not have had a robust background in rhetoric and composition, but I had on-the-ground experience teaching a variety of non-traditional students, including the rural students my then-current institution served. We were one of the first higher education Twitter chats that concerned itself with teaching and pedagogy as its central topics. Other chats, such as #digped and #profchat, have been started in the meantime, but I will always be proud of the fact that our chat represented an important step toward the increased visibility of teaching and pedagogy in higher education. ¶ 21 Leave a comment on paragraph 21 1 Because of the inconsistent nature of the archives within my possession, a distant reading of the contents of the chats is currently impossible. But I can perform a close reading and visualization of a specific chat. Because of the topic of this essay and special issue, I decided to look more closely at a chat archive where the topic was around creating space for collaboration and community in the composition classroom. ¶ 22 Leave a comment on paragraph 22 0 The full archive, using a method developed by Martin Hawksey, is available here as a Google spreadsheet. The archive of the chat itself starts at 2:00am Thursday February 21 GMT, which is 9pm on Wednesday night, Eastern Standard Time. The spreadsheet pulls in all the tweets that use the hashtag over a certain period of time, not just the Tweets from the chat itself. ¶ 23 Leave a comment on paragraph 23 0 One of the advantages of using this archiving technique is that it also gives a summary of the statistics and a dashboard view of activities using the hashtag. You can also see a visualization of the chat (it’s dynamic; play around in it) and a searchable visual archive. For this particular chat, there were approximately 200 tweets by about 25 participants. We shared 25 links, retweeted 56 times, and the average number of tweets per participants was a little more than 5. There were also almost 100 interactions or conversations that took place during that period. ¶ 26 Leave a comment on paragraph 26 1 Participants shared links and advice, threw out questions, and generally had a productive chat talking about community and collaboration in the classroom. The conversation favored discussions around community rather than collaboration (as one tweet put it, it’s much easier to “push” collaboration than community). It’s one of the values of Twitter chats in that it is participant-driven, and thus it can shift and evolve over the space of the hour, as it did here. 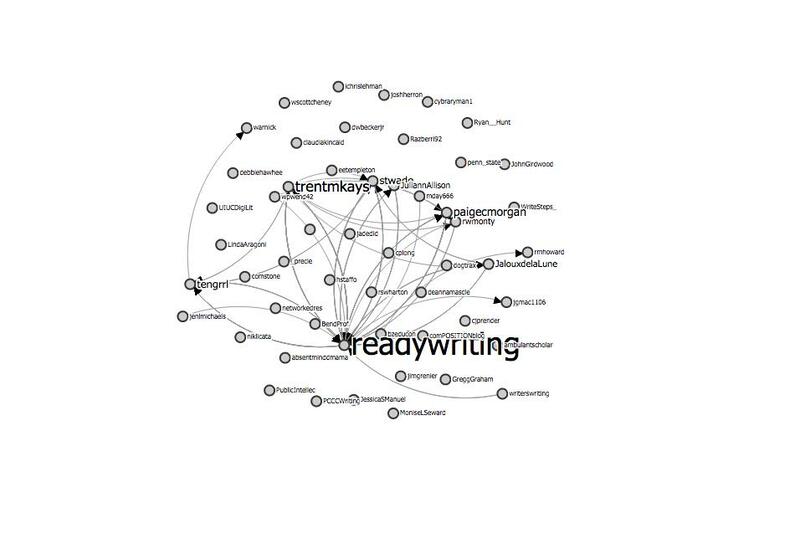 ¶ 27 Leave a comment on paragraph 27 0 If you look at the visualization, I (@readywriting) appear prominently as the moderator. I always made sure that people’s tweets were responded to in some way, either as a retweet or in answering their questions. This practice has been identified by Budak and Agrawal (2013) as one of the ways to create a vibrant and successful Twitter chat, particularly for newcomers, in order help them feel a part of the community (172). Community and conversation were always among my goals in creating #FYCchat, so it was reassuring to see my practices backed up by more robust research in the area. 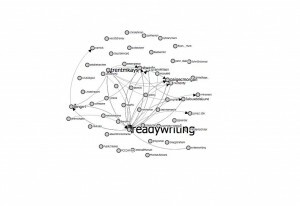 ¶ 28 Leave a comment on paragraph 28 0 Again, looking at the visualization, you will also notice lone twitter handles that have no connection to the conversation. These are often people who are using the hashtag to promote and/or broadcast their own work and not often engaging in a broader discussion within the community itself. ¶ 29 Leave a comment on paragraph 29 1 It seems fitting that I’m writing this piece now as both co-founders have moved out of the writing classroom and into new, alt-ac positions, although both are deeply involved with teaching and learning. Certainly, creating and moderating #FYCchat played a role in both of our transitions, in terms of being able to concretely show our dedication to teaching and learning, as well as to connected, collaborative learning and openness. Our schedules no longer permit us to host the chat, but hopefully someone else will take up the mantle and the hashtag and start it again. ¶ 30 Leave a comment on paragraph 30 1 It also seems like a good time to think about why #FYCchat didn’t gain more in popularity in terms of number of participants. I wrote in my NCTE talk in 2012 that I thought that #FYCchat wasn’t legitimate enough for broader participation and that it was seen as too risky for contingent faculty (see Daniels 2015). Perhaps the larger rhetoric and composition community will always be centered around listservs and more legitimate publication, but I think there is still a need for the less formal space #FYCchat provides. ¶ 31 Leave a comment on paragraph 31 0 #FYCchat has certainly transformed my teaching, ultimately benefitting my students. It has also shown me how powerful collective, collaborative learning can be, and where it can lead. It has given me an alternative mentorship model, more reciprocal than hierarchical, while reinforcing how regimented and structured higher education continues to be. ¶ 32 Leave a comment on paragraph 32 0 Lee Skallerup Bessette is Faculty Instructional Consultant at the Center for the Enhancement of Learning and Teaching (CELT) at the University of Kentucky. Her interests include Digital Pedagogy, Connected Learning, and Student-Centered Pedagogy. She has a PhD in Comparative Literature and is also interested in translation, both literal and figurative in literature and in education. She blogs at College Ready Writing (https://www.insidehighered.com/blogs/college-ready-writing) and you can find her on Twitter as @readywriting. ¶ 41 Leave a comment on paragraph 41 1  For a long time, we thought the complete archives of #FYCchat were lost. But Twitter made available, through their website interface, the entire history of a hashtag through their search bar. Collaborating with Pat Lockley and Huma Bird Project, they created a browser add-on that would scrape Twitter to extract the data off of the website. You can find the archives in their entirety here. Access to this data is still recent, and thus I have been unable to perform any sort of analysis for this essay. I welcome suggestions or offers for collaborations to work with it. Lee, I would argue that this conversation is not just on the margins of comp/rhet but also on the margins of the humanities (in as much as comp/rhet is at margins of the humanities) and at the margins of higher education (as many claim the humanities are). As Lee suggests in this paragraph, her article went through the JITP review process before she and the issue editors decided to present it for public peer review. Perhaps that “etc” could be clarified and expanded to include the history, theory, and scholarship of the field. I think this gives more credence to comp/rhet as a serious field of study, not just a practice in the classroom. I’ve been trying to find more constructive pieces and came across this which is a good roundup. It would be a good thing to crowdsource! The ending of this para confused me. I think you mean he suggested credentialing and u r suggesting informal, but it doesn’t read clearly. I think you mean writing “instruction” (no s) in the first sentence. Also, Ann Larson has a lot of work on this subject here: http://annlarson.org/?s=adjunct&x=0&y=0. Also, can we make this a block quote so we can pull it out via our WP plugin? Can you share some of the evidence that the establishment was seeking solutions? MLA doesn’t ask for date so now i find myself wondering what year this was? Most folks in the discipline call it first-year composition (FYC) rather than Freshman Writing, which is both old school and sexist. So change that? There’s a fairly long history of using multi-user chats for co-mentoring and professional development, even within rhet/comp. With Becky Rickly and Eric Crump, I have a chapter called Creating a Virtual Academic Community: Scholarship and Community in Wide-Area Multiple-User Synchronous Discussions in Computer Networking and Scholarly Communication in the Twenty- First-Century University. eds Teresa M.Harrison and Timothy Stephen. Albany, New York: State University of New York Press, 1996, for example, and although not a lot has been published about The Tuesday Cafe and the TechRhet Barn, academic mentoring conversations in real time chat flourished on MOOs, mainly during the 90s. A couple of these links might help. It might help the article if you acknowledge that this online chat-based co-mentoring has a rich history. This is really interesting! I think a connection to k-12 education is important and underutilized in higher ed scholarship. Although selfishly, I think a nod to the Writing Studies Tree (writingstudiestree.org) and our commitment to highlighting and archiving mentorship in comp/rhet would be appropriate here. The fact that these relationships are important is the thesis of the project. Perhaps a discussion of why distant reading would be informative here? Could you close read some moments from the chat that connect to the themes raised in earlier sections? For instance, how does mentoring manifest? What kind of knowledge was exchanged? I’d love to see some tweets embedded as evidence of your earlier arguments. Also, it would be great to have specific examples of how the twitter chat manifested in your own first year writing classroom/pedagogy/career. What support & teaching resources did it provide to you? How does #FYCchat address contingency and a dearth of training among faculty leading first year composition classes? This last question might be bigger than a comment on this particular paragraph! You do a nice job of explaining the need and motivation for #fycchat, and you give a helpful overview of the life of #fycchat, but I’d love to see more discussion of particular ‘outcomes’ to use a sort of icky word, of the chat, assessing what #fycchat did well, what space it opened up on a disciplinary level (perhaps this would fit where you talk about # of participants). There might be room, too, for some future-looking–a call for future twitter chats, or a manifesto for collaboration/community around first year composition/acwri/higher ed. I would also like to see a definition of #alt-ac and perhaps a brief engagement with that realm. It seems to me many contingent FYC instructors are considering/have ended up in these roles. How does #FYCchat compare in number of participants to other education/academic chats? Are there non-hashtag-organized conversations about rhet/comp on twitter (i.e. a community of people in comp rhet that talk to each other/follow each other)? Website content © Journal of Interactive Technology and Pedagogy + Comments 2019. All rights reserved.